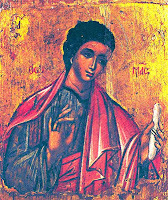 I’ve always felt a particular affection for the apostle Thomas. His was not the way of blind faith but of reverent agnosticism. “Except I shall see in his hands the print of the nails, and put my finger into the print of the nails, and thrust my hand into his side, I will not believe.” Even more than Peter’s timidity after the trial of Jesus, his doubts strike a chord with modern man. 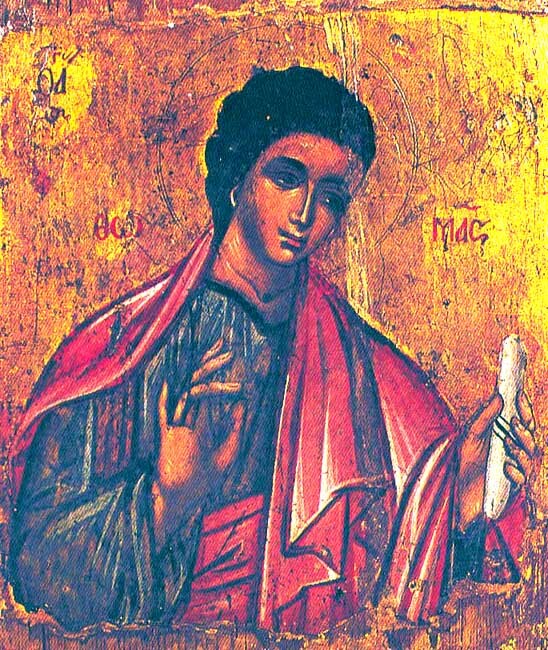 It is interesting and possibly significant that, alone among the apostles, Thomas is celebrated twice: on his feast day of October 6 and on the Sunday after Easter. Moreover, the Gospel reading at the beautiful ‘Service of Love’ on Easter Sunday is the story of his doubt. With a wonderful sense of the dramatic, the priest's chanting of the Gospel rises to a crescendo as he ends with the words: “I will not believe,” a real cliff-hanger until the story is completed the next week. The story does end, of course, on a high note as, when Thomas actually meets the risen Christ, he kneels before Him and utters the simple words “My Lord and my God.” Jesus gently ticks Thomas off for his doubt but, according to tradition, the apostle went on to become a valiant missionary to Persia and India and a martyr for his faith. We could all have said the same as Thomas and, in a manner of speaking, we often do. How lovely it would be to be able to say at all times “I know that my Redeemer liveth” instead of “I believe” or even on occasions “I’m not really sure but …. .” To have no doubts, however, is surely to have no thoughts. To have no doubts is to have no free will. Is doubt always a bad thing? Ellis Peters has her fictional monk Brother Cadfael make the insightful comment, “I sometimes like to put a little sand of doubt into the oyster of faith” and it could be argued that more pearls of wisdom may be grown out of doubt than out of certainty! The trouble with certainty is that it can be fragile. Too much dotting of i’s and crossing of t’s in faith creates a climate wherein the smallest doubt can destroy the whole structure. For example, if one’s faith is based solidly on the literal historical truth of Genesis, the findings of evolution can destroy the whole foundation, unless one resorts to nonsensical notions of God creating fossils to test our faith! If, however, we leave the details of creation to the physicists and the development of the species to the palaeontologists and base our faith on the love of God and the person of Jesus, then the theory of evolution can do nothing to undermine our faith. Somebody once made the very wise comment that the Bible tells us what happened, Darwinism tells us how it happened (or more accurately, how it may have happened). In any case, as the realm of science becomes more speculative, we find that the chasm between religion and science may well be narrowing. The mysteries of particle physics, where an object can be in two places at the same time or where it may be possible to create matter out of energy, mean that the ‘unknowns’ of science may be as mysterious as the ‘unknowns’ of faith. The Methodist theologian, Leslie Weatherhead, in his classic book ‘The Christian Agnostic’ reminds us that we know far less than we don’t know. “Don’t exclude yourself from the fellowship of Christ’s followers because of mental difficulties. If you love Christ and are seeking to follow him, take an attitude of Christian agnosticism to intellectual problems at least for the present.... Only accept those things that gradually seem to you to be true. Leave the rest in a mental box labelled, ‘Awaiting further light’.” I like to think that Donald Rumsfeld’s famous (or infamous) statement may have more to say about theology than about the conduct of a war: “There are known knowns. These are things we know that we know. There are known unknowns. That is to say, there are things that we know we don't know. But there are also unknown unknowns. There are things we don't know we don't know!” Is Donald a closet Orthodox theologian? Thanks for that. I remember reading Weatherhead's 'The Christian Agnostic' ages ago, in the mid-70's, if memory serves, and being suitably convinced, or should I say unconvinced?! Iron-clad certainty can feel like a nice personal luxury and I suppose it can do some good in some situations, but it can also lead to problems. Funnily enough it was largely Weatherhead's assertion that you could be a Christian and still have doubts that got me over a period of great doubt!